Altek 942 frequency calibrator – no longer in production! The Altek 942 was designed back in 1996 and was last manufactured in 2015. The PIE 541 matches the Altek in fit, form and function with a few features bringing the design into the 21st century. Instead of the six “AA” batteries in the Altek the PIE uses a single 9V battery. The PIE has the same resolution and accuracy as the Altek with longer battery life letting you calibrate more instruments between battery changes. They both have ranges with high resolution in Hz and kHz as well as ranges for CPM (Counts-Per-Minute) and CPH (Counts-Per-Hour). A built-in BNC connector is available when the PIE 541-BNC is ordered. LED flashes in sync with frequency output. LED also flashes in sync with reading for fast adjustment of trigger level. 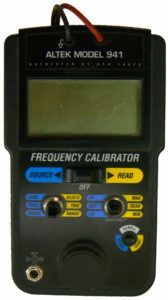 Why choose a PIE 541 instead of some other brand of frequency calibrator? Like the Altek, the PIE 541 works with many different types of frequency instruments. We are the same team that designed the Altek 40, 40A, 241, 941 and 942 frequency calibrators and no other manufacturer has as much frequency calibrator experience as PIE. PIE also manufactures a complete line of milliamp, voltage, thermocouple, and RTD single function calibrators as well as multifunction calibrators matching and surpassing the Altek line of handheld calibrators. When it is time for service on your Altek 942 PIE has the most experience in calibration and repair of Altek electronic calibrators. Or, if it is time to upgrade or replace a failing Altek 942 calibrator, we offer a discount on a new PIE calibrator similar to the Altek that you are replacing – in working or non working condition! Click for repair and calibration pricing.